Pregnant ladies should definitely engage themselves in some kind of exercise for a healthy pregnancy. Exercising during pregnancy will not only relieve back pain but also help them during labor by increasing their stamina and muscle strength. No doubt exercise is helpful, but one really needs to take extra precaution while exercising, to ensure the safety of the unborn child. • Exercise will help burn calories, hence it is important for you to increase your calorie intake. • Always warm up before exercise and cool down after exercise. • Avoid doing any strenuous or dangerous activities that have a high risk of falling like horse riding, downhill skiing, gymnastics, and cycling. • Drink plenty of water and other fluids while exercising. • If you have joined exercise classes, make sure your teacher is qualified, knows that you're pregnant and also knows how many weeks pregnant you are. • Try exercises like swimming. Swimming is a very good pregnancy exercise, as the water supports your increased weight. • Wear loose fitted breathable clothes while exercising. • Wear shoes that fit your feet properly and give good support. • Avoid getting up from the floor too quickly while exercising. Getting up quickly can make you dizzy and cause a fall. 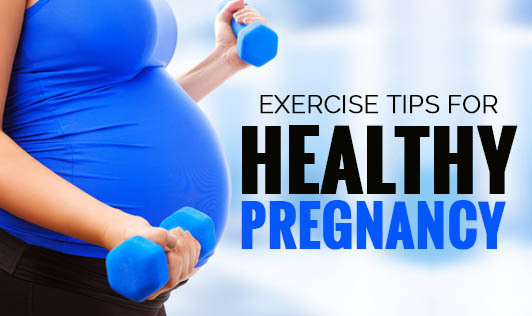 Remember, while it is good to exercise during pregnancy, it is important to consult with your doctor before starting any kind of exercise, and if in case you observe any danger signs like vaginal bleeding, dizziness, decreased fetal activity or any other unusual changes in the body, stop exercising and get in touch with your doctor immediately.